Nomad Games has created a new card game called Fighting Fantasy Legends which is based on the iconic Fighting Fantasy RPG books created by Steve Jackson and Ian Livingstone. Fighting Fantasy Legends is a card-based role-playing game set in the world of Fighting Fantasy. The game will feature three iconic books from the series – City of Thieves, The Warlock of Firetop Mountain and Citadel of Chaos. Check out the announcement trailer below to whet your appetite on what you can expect from the new Fighting Fantasy Legends card game which will be launching soon and will available on Steam, iOS and Android this summer. Fighting Fantasy Legends is a card-based role-playing-game set in the world of Fighting Fantasy. As the series reaches its 35th anniversary, Nomad Games is putting a new spin on these familiar adventures. The player will explore the continent of Allansia, collecting cards and powering up their dice. Tricky decisions lurk around every corner as the player advances through decks of cards themed to their location, including cities, dungeons and more. “I am delighted that Nomad Games have developed Fighting Fantasy Legends. As fans of Fighting Fantasy, we know the Nomad team has gone the extra mile in making their game not only exciting, but as realistically authentic as possible. Exploring Port Blacksand, Firetop Mountain and the Citadel should be a delight for the fans of the books!” Ian Livingstone, co-creator Fighting Fantasy. 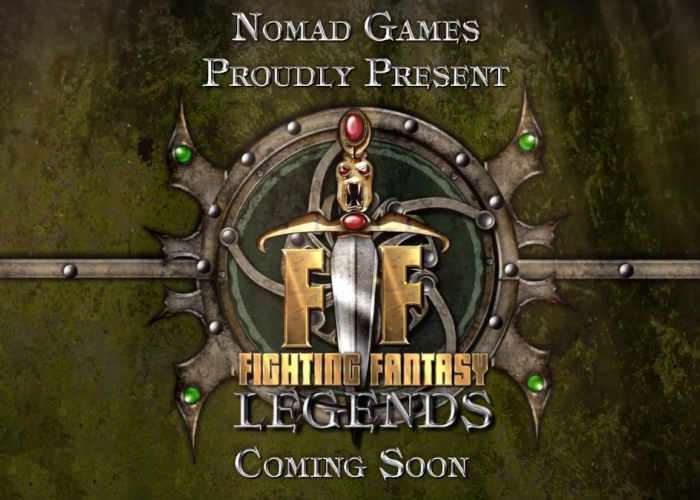 For more information on Fighting Fantasy Legends ahead of its official launch jump over to the official Nomad Games website for more information by following the link below.